Princeton imports energy from distant locales, largely unaware of the environmental fallout both at the source of that energy and at the destination of the resulting greenhouse gases. It would be far more sustainable, and responsible, to source energy from local above-ground sources rather than the underground sources we import, and that means harvesting solar energy either directly or from trees. In that light, so to speak, there's something less than beautiful about the Westminster Choir College's new building. It's that bare roof. I've heard they intentionally gave the roof an auspicious southern orientation, but decided to hold off on solar panels for budgetary reasons. I'd like to see what numbers were used to support that logic. As shown by a neighbor of mine in an earlier post, it's possible to lease solar panels for no money down, then pay for the resultant energy at a lower rate than if it were coming from a power plant. The persistent belief that solar panels are expensive reminds me of circular conversations I've had about native landscaping: "I can't afford the maintenance." "But natives require less maintenance than you're doing now." "But I can't afford the maintenance." "But natives require less maintenance than you're doing now." Ad nauseum. Current realities don't penetrate through long held assumptions. Another spurning of local energy is the chipping up of all wood. This is understandable for softwoods and pesky branches, but chippers are now so strong that they can swallow whole trees, trunk and all. I've heard there are clean-burning incinerators that could turn the chips into energy, but none nearby, so the chips are hauled away to be composted--a nice-sounding but machine-intensive process that requires turning of the windrows by big machines, and then more hauling to get the product to a new location. Nice mulch, but the end result is consumption of imported energy, rather than production of local energy. Princeton borough used to leave cut street trees at the curb for a few days for residents to scavenge good firewood, and wood stoves are an efficient, deeply satisfying, and surprisingly clean source of heat. But the new town policy is to haul wood away to distant locales, which increases energy consumption, staff time spent, plus whatever fee the composting facility charges. At last night's town council meeting, Princeton resident Daniel Harris called for an accounting of all the town's energy usage, including vehicle use, to determine how to cut back. It won't come close to matching the phenomenal amount of energy used to, for instance, incinerate the town's sludge, far from the public eye down on River Road, but it's a useful exercise that could shift thinking and consumption habits. We also need to be looking at all the sources of potential local energy that are currently being spurned, and ask why we continue to ignore local energy harvest in favor of distant sources like fracked gas. We have a wonderful park behind our house. It's Potts Park, the pocket park that's become popular even though it's hidden away on a back street. If we were to, in true Princetonian fashion, ignore its many fine features and instead zero in on an annoying fault, it would be the water fountain that on and off all summer refused to turn off, despite attempts to fix it. Other parks, too, like Harrison Street Park, succumbed to water fountain dysfunction. Perhaps all the sand kids keep putting in there gets lodged in the mechanism. Or maybe town parks departments, seeking the most foolproof fountain to buy, assuming they have a budget, need the sort of online equipment reviews we use to make purchase decisions. Those climbing on the Dinky to head to the Climate March this weekend can park for free in the University Lot 7 parking structure (back left in the photo) located midway between the old Dinky station and the current temporary station. Access it from the traffic circle on Faculty Road. Drive up Elm Drive, take the next traffic circle left. The ongoing University policy, and I assume it remains unchanged from when I checked some months ago, is that the parking structure is open to the public without charge on weekends and after hours on weekdays. This Sunday, Sept. 21, beginning at 11:30, people from all across the country will gather at Columbus Circle in New York for what's being billed as "the largest climate march in history." I've never taken part in a march, but I'll go to this one, and I encourage everyone else to head to the Dinky that morning with plenty of time to spare. The most troubling thing about climate destabilization is that so little is being done to slow it down. The worst sorts of problems, whether at the level of the individual or global, are those that languish and deepen for lack of action. Once a problem is acknowledged and the first few significant steps are taken to solve it, there is an immediate sense of relief. For instance, there was no lack of scary pronouncements on the world’s prospects at a meeting of Princeton's chapter of the Citizens' Climate Lobby this past weekend. Yet, there's comfort in participating in a national organization working patiently for positive, bipartisan action. At this month’s meeting, we gathered in a Princeton living room to hear via speaker phone from retired Rear Admiral Len Hering. It felt reminiscent of President Roosevelt's fireside chats during WWII. During his career in the Navy, Hering led a successful effort to reduce the Navy's energy consumption by 40%. I felt some kinship, having reduced our home energy consumption by a similar amount without sacrificing comfort. Hering sees a clear and present risk to the world his three grandchildren will inherit, and says "we're not having the adult conversation needed." He described how a 12 year drought in Syria and the resulting social and political instability had opened the door for radical elements like ISIS. Dramatic sea level rise this century, combined with storm surges, will create millions of refugees, further destabilizing governments around the world. These grim prognoses will be far less depressing the moment we take action and shift course. Staying with the status quo may feel safe, yet it is creating huge risks. Climate destabilization, collectively created, is a shared enemy. Action to slow it will be a unifying force, and that action must come at all levels, from the global down to the individual. The march is timed to precede the U.N. Climate Summit later in the month. Details on how to participate in the march (e.g. no wooden sticks for banners!) can be found at PeoplesClimate.org. Note: There are many events this weekend related to the march, info for which should be on the website. Recently, I had a dream in which the McCaffery's supermarket at the Princeton Shopping Center was moving. I was in the store and noticed most of the shelves were bare. Were they remodeling? I asked a manager, and was told that they were moving to some distant intersection I didn't recognize but assumed was out on a strip development outside of town. I was understanding. No doubt they'd get more customers out on some busy road. This is not a recurring dream, and it was unusual in being very matter of fact, lacking the improbable leaps in plot and logic that dreams usually display. One of the more instructive things dreams often leave behind is a feeling, and the feeling in this dream was of a stripping away of power. I rarely drive to McCaffery's. It's so close I can ride the bike, and bring a considerable amount of food home, stacked carefully in a large paper grocery bag in the kidseat. A backpack accommodates any overflow, and the occasional bag of dogfood fits well between the seat and the kidseat. At the cash register, I ask for one paper bag if I haven't brought one along, and put most of the food back in the cart loose, explaining that it all has to be repacked on the bicycle. Outside at the bicycle hitching post, memories of westerns in which the cowboy is carefully stowing provisions in those leather satchels on his horse come to mind. The payoff, as I put canned food and flour in the bottom of the bag on the kidseat, saving lighter and more fragile items for the top, is a feeling of freedom and independence. Cars are wonderful tools, but they are deeply flawed, which when I need to use one makes me feel not guilt but a sense of mourning. They are so beautifully engineered, so smooth and quiet, that it's easy to forget the backstory, that the fuel cars use becomes steadily more difficult and risky to extract, and the consequences of their exhaust, though stripped of odor and smoke, are fraught with longterm peril. But beyond that, the sense of empowerment a car can provide is also a form of dependence. The world most people wake up to every morning is scaled not to us and our capabilities, but to a machine's. Businesses, schools and friends are scattered and unreachable without contributing to a vast atmospheric experiment fraught with risk. The layout of suburbs strips any kid under 16 of the power to reach school or friend without adult assistance, which in turn tethers adults to the steering wheel, shuttling kids hither and yon. This is not freedom but freedom lost. It means walking out the door knowing that you are helpless, your legs insufficient to the task of getting anywhere meaningful without the assistance of a machine. That's the bad dream that, living in a town like Princeton, with businesses, schools and many friends close by, we might dream but need not live. When Joe Budelis came to my "open garden" event last month, he mentioned he had found some nifty answers to a couple of life's persistent questions. One of these recurrent questions is what to do with spent alkaline batteries. Currently (subtle pun there) they aren't accepted for recycling locally. And of course they aren't rechargeable, or so I assumed, until I saw Joe's Rosewill recharger for alkaline batteries. Yes, we live in a magical world where non-rechargeable batteries can in fact be recharged. There are a few tricks to using it, but Joe says it has served him well, and he used to have a model that charged the larger sized alkaline batteries as well. Unfortunately, an internet search shows this fine item to be unavailable. Dare we suspect that liability has once again reared its fearsome head? Or perhaps Rosewill has decided to focus instead on perfecting its reversible aging chamber. That would be a bed with electrodes at either end for head and feet that send a gentle electrical current through your body while you sleep, causing you to wake up in the morning feeling five years younger. Speaking of batteries, in the form of energy that's stored in firewood, Joe also showed me a way to split wood without an axe. It's a wedge with a telescoping handle. A good name for it is elusive. One vender calls it a Manual Slide Log Splitter. On ebay, it's called a "Hand sliding slide hammer type wedge log splitting tool". It doesn't apply as much splitting pressure as a axe or maul, but Joe says it works well enough to supply wood for his fireplace. For anyone who'd rather not wield an axe, this is a good alternative. Thanks to Joe for recharging our sense of the possible. 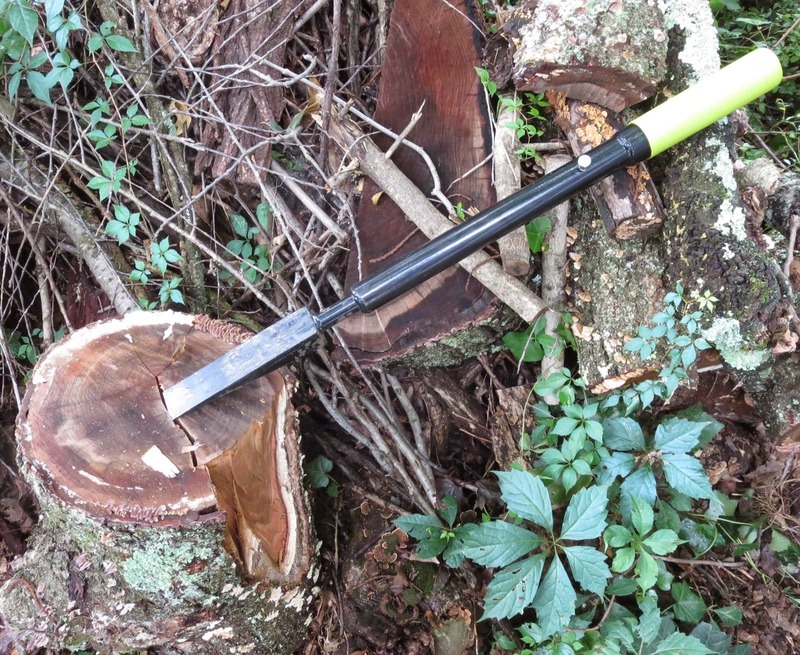 In the process of seeking out the log splitter on the web, I found a variation of an axe that looks like it has potential. The blade is flared at the top to shift the center of gravity to one side, so the blade enters the wood, then acts like a pry bar, all in one downward stroke. A bit pricey, but worth exploring, here and here. The videos also demonstrate the "old tire" approach to log splitting, which keeps the wood upright while you split it. It's National Walk/Bike To School Century! A beautiful September morning, 20 minutes before classes start, and no traffic jam to be seen. Instead, students are flocking to Princeton High School on bikes and on foot. Is it real? It was real yesterday morning. Had I missed the memo? Was it National Walk/Bike to School Day? No, that's October 8. Maybe there was an inspiring announcement in school the previous week about the benefits to self and future of walking/biking. Or maybe they all plumbed last year's depths of WalkablePrinceton. Has Princeton embraced unified action to slow climate change, inspired by the upcoming march in NY? Whatever it was, it felt safe, for Princeton's streets, for the kids, and for the future. And it felt right--individual action and global realities suddenly aligned. But maybe I read too much into it. Maybe kids are riding and biking simply for the taste of independence, the pleasure of morning air, or because their parents have other things to do. I've played the chauffeur at times, so can attest that a school day morning is the worst time to be crowding the streets with bulky cars. Drivers are in a hurry, perhaps not fully awake--I suspect some are still in their pajamas--and the dropoff in front of school is awkward. I drive up Franklin Ave, dismayed by the inefficiency of a cold engine while cars poke their noses out from side streets like ghosts in a game of Pacman. The best thing one can do for safety in Princeton is to take a car off the street. Still, there are attractions to chauffeuring a kid to school. It's a quiet moment to talk, if one isn't too harried by the traffic. And maybe it's interpreted, by the kid at least, especially a middle schooler ambivalent about independence, as an expression of parental love. So kudos to the kids who are participating in Walk/Bike To School Century, and one question for the schoolboard: Have you thought of getting more bike racks? They're packed to the max. It may come as a surprise that you can get a solar array on your house with no up front cost, and reduce your energy bills in the process. That sounds like something a phone solicitor might say, but my friend and neighbor Peter Thompson, who has considerable technical expertise as manager of IT at Princeton High School, decided to research the issue, and ended up with solar panels on his roof. He went with solar even though his roof doesn't face south, and is shaded for part of the day by nearby trees. Despite these less than ideal conditions, the panels are projected to supply nearly half of his home's energy needs. Since getting the panels up and running, he's learned that they produce significant energy even when it's cloudy. In a detailed writeup with photos and graphs about his experience researching solar and getting the panels installed, he describes the various factors that influenced his decisions about whether to purchase or lease, how many panels to get, and what sorts of financial incentives are in place. His explorations of this may have begun when I asked him about the possibility of using energy from solar panels during power outages. Most solar arrays shut down during power outages, for reasons Peter explains in his writeup. But he was able to negotiate with the installer to include a way to feed solar-generated electricity to one wall outlet even during a power outage. That electricity can then run small electronics and charge a battery that could be used at night. My ideal would be to have an electric car whose batteries could keep the house going in low energy mode during a power outage, with the solar panels providing a means to charge the car's batteries. Peter's writeup shows how he took a significant step in that direction. He also gives contact info if you want to ask him any questions. If you're driving down Hamilton Ave, his house is at the corner of Horner, just past Harrison St. Thanks to Peter for sharing his research and experience with the community! Princeton's Riverside Elementary is getting a new roof. If the materials stacked on the roof are any indication, that may mean the school's getting better insulation as well. I'm told that the insulation being applied varies in thickness, so that water will drain off the otherwise flat roof. Roofs are replaced every 20 years or so. It seems a mundane thing, but any money spent to heat/cool the buildings is money that's diverted from our childrens' education.